I had a bit of time this morning (actually I didn’t, but I had a mango on the turn and thought that was more important than getting to work on time). I always thought porridge was a bit rubbish without golden syrup laced through it, drizzled on top of it, poured straight into my mouth from the bottle, forget the damn porridge right?! But, I’ve been a bit obsessed with coconut ever since I got back from Thailand, everything that I can get my hands on that’s coconut flavoured I either eat, or spread all over my body… Anyway, I’ve tried a few recipes but most of them seemed to contain manky shmooshed up banana (barf) and not enough coconut for my liking. So I made my own one up. I got a little carried away the other day though and impulsvley bought a couple of passion fruits to add to this recipe, but you don’t have to (you should though, it’s great). Also, I try and cut my mango up the night before, as butchering it first thing in the morning is sticky, fiddly and when I’m tired and grumpy not an enjoyable experience. You can buy it pre chopped but it tends to be more expensive, I always end up feeling a bit resentful when fruit costs more than a packet of Marlborough Lights. Also, did anyone else imagine they were eating goldfishes when they tried mango as a kid? No?… Just me then. (I should mention that this recipe is quick to make provided you angrily chopped your mango the night before like I did. It’s also vegan if you care about that sort of thing). 1. Pop your oats in a small pan and add the coconut milk, desiccated coconut and the water. On a medium heat bring the boil stirring continuously. This wont take long, trust me. 2. Once boiled turn down the heat and add the cashew butter, mix until absorbed. I know it looks a bit like baby poo but it tastes a lot nicer believe me. 3. Take the pan off the heat and add half your mango to the pan and give it a good stir. 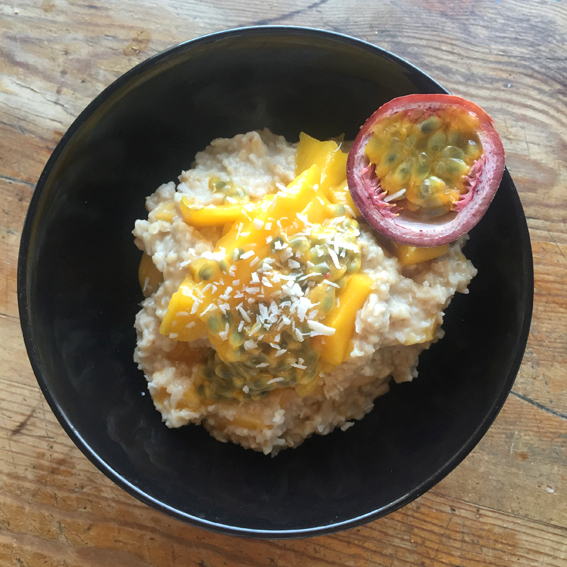 Pour the porridge into a bowl and top with the rest of the mango, passion fruit and a sprinkle of desiccated coconut. That’s it… Bye bye! Must try this! Sounds and looks totally delicious.